A mysterious cat woman reportedly leaps over walls and into houses in colonial Egypt. Gareth Owen, the Mamur Zapt of colonial Egypt (The Fig Tree Murder, 2003, etc. ), is mystified by the dead cats swaddled in bandages and tenderly mummified. He’s not quite as surprised at the body that lies under them, presumably the victim of a domestic dispute and not the sort of political conspiracy that would have put her under his purview. Still, when Owen must intern all the German nationals in Egypt on the eve of WWI, Hilde Langer Hanafi’s name keeps cropping up. She was a German married to a local worker at the sugarcane factory in Minya, where 200 missing British rifles may have been supplied a de facto army loyal to the other side. Her in-laws disliked her foreignness, her barrenness, her piano-playing, and her habit of feeding neighborhood cats—but did she know too much about the missing rifles? Owen’s inquiries turn up a cache of arsenic, an odd twist to the local habit of hiring simpletons and even girls to police villages, and some serious finagling at the Ministry. He’ll have to examine reams of official documents, belly through miles of sugarcane to safety, and come to terms with the culture clash between himself and his love, Zeinab. 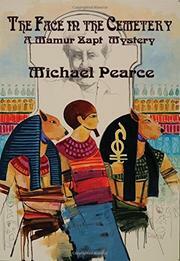 Pearce’s wit is having an off day, but he still manages to convey the stench, hubbub, and intrigue of British Egypt.